From the towering Grand Buddha of Leshan to the mighty Yangtze River, China’s spectacular landmarks help visitors to better understand the country’s past. Imperial palaces, temples and awe-inspiring natural wonders combine in the world’s fourth largest country, giving you the opportunity to step back in time and experience China’s culture first hand. In this article, we’ll guide you through some of China’s most famous landmarks to tell you about their history and what you can expect to see when you visit on your holiday. Rising 233 feet, the spectacular Grand Buddha of Leshan is surely one of China’s most impressive landmarks. The imposing stone Buddha was built between 713 and 803, during the Tang Dynasty, and depicts Maitreya, who is regarded as a future Buddha of this world in Buddhist eschatology. Buddhists believe that Maitreya will appear on Earth in the future to achieve complete enlightenment and teach the Dharma. So the story goes, construction of the Buddha was led by a Chinese monk named Hai Tong. He hoped that it would calm the turbulent rivers and when funding for the dramatic statue was threatened, he is said to have gouged out his own eyes to demonstrate his sincerity. After Tong’s death, the project remained on hold until 70 years later, when his apprentice continued the build. It was completed in 803. The Leshan Buddha is carved out of a cliff face at the confluence of the Min River and Dadu River in the province of Sichuan, near Leshan. 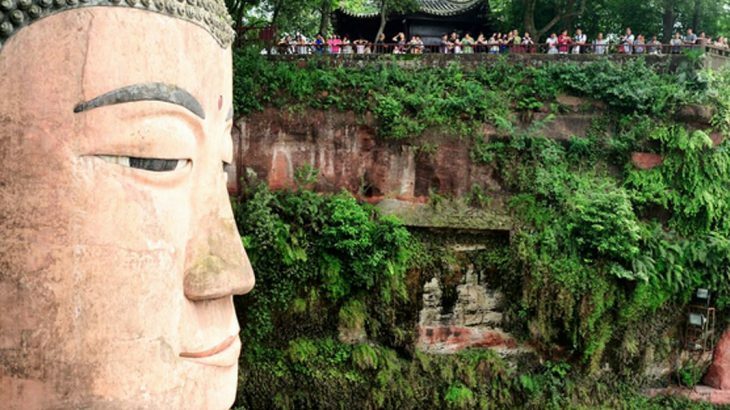 It faces Mount Emei, and is the tallest pre-modern statue in the world. Its sheer size and historical significance were recognised by UNESCO, which dedicated it a World Heritage site in 1996. 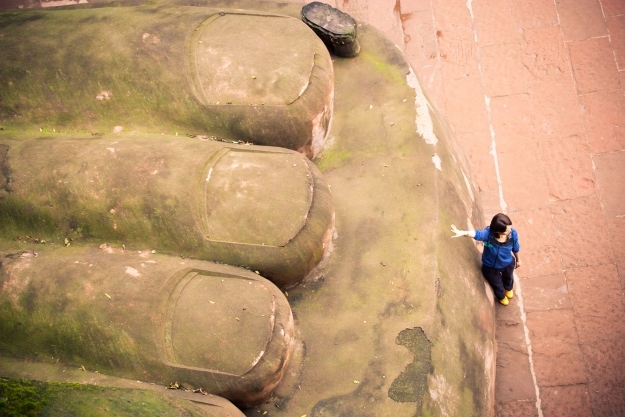 On your China tour, you’ll get the chance to view the Grand Buddha of Leshan from above, and then from the river on a boat trip to truly appreciate its magnitude. Erin of Travelling Thru History dedicates her blog to fascinating historical sites she’s visited, including the Grand Buddha of Leshan. “I’ve really enjoyed learning the background of these places and want to share what I’ve learned with others in hopes that they will love them as much as I do,” said Erin. 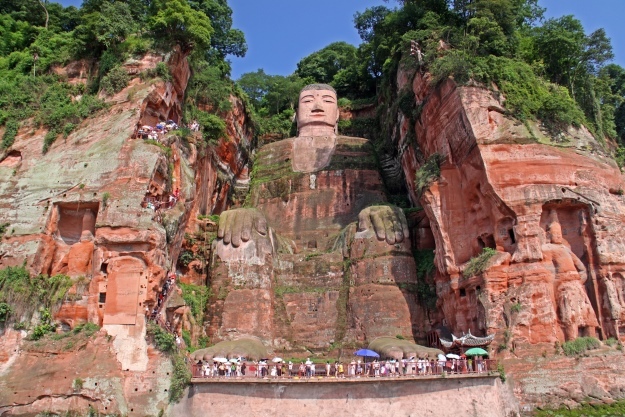 “As for Leshan Buddha, that site fantastic. The grounds are expansive and quite nice to wander around with statues, stone carvings, waterfalls, a beautiful pagoda, a temple with intricate wood carvings and an elaborate shrine, and lovely views of the city across the river (when the smog clears). “The stairs are quite steep. If you have trouble with stairs or the steepness makes you nervous, there are boat tours you can join to view the statue from the water. I highly recommend bringing plenty of water and a hat if you plan on visiting via the stairs. We were in line for two hours in direct sun for a vast majority of the time and it was both hot and humid. Be sure to bring snacks. There was a snack vendor for part of the time we were in line, but it was quite difficult to purchase anything as there is a lot of movement. Use the stairs on the far side of the statue. There is no wait over there most of the time since that is where people come back up and the return flow is very light. Pay attention to the walls while going down and back up the stairs. There are many fascinating carvings and designs cut into the walls. Stretching for an incredible 13,170 miles across the northern borders, the Great Wall is undoubtedly one of China’s most famous landmarks. The structure consists of numerous walls and fortifications, many of which run parallel to each other, although the most-visited sections can be found just outside Beijing. 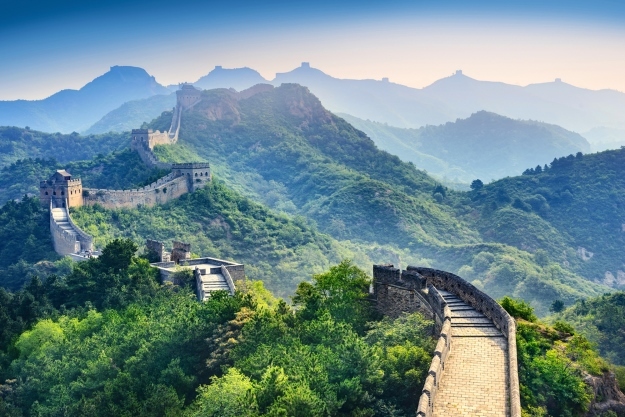 The idea for the Great Wall of China came from Emperor Qin Shi Huang (259-210 BC) and was intended to prevent intrusions into the Chinese Empire. Although the wall never effectively stopped invaders from entering China, it served as a ‘psychological barrier’ between Chinese civilisation and the world, according to historians, and remains a powerful symbol of the country’s strength and resilience. Construction began on this remarkable structure as early as 7th century BC, however the structure as we know it today exists mainly because of work completed by the Ming dynasty (1368-1644). Although early Ming rulers had no interest in building border fortifications, when the Yongle Emperor announced China’s new capital, Beijing, Chinese culture flourished, and the construction of temples and bridges increased. Subsequently, work on the Great Wall resumed. In the mid-17th century, the Manchus (from the then-named region of Manchuria in north east China) breached the Great Wall and encroached on Beijing, forcing the fall of the Ming dynasty and marking the beginning of the Qing (Manchu) dynasty (1644 – 1912). From this point, the Great Wall became a symbol of China to the Western world. Today, it is recognised as one of the world’s greatest architectural marvels. In 1987, UNESCO designated the Great Wall of China a World Heritage site. Many escorted tours will take you to the Great Wall, where you can also hike a large section of it on a three-day trip. 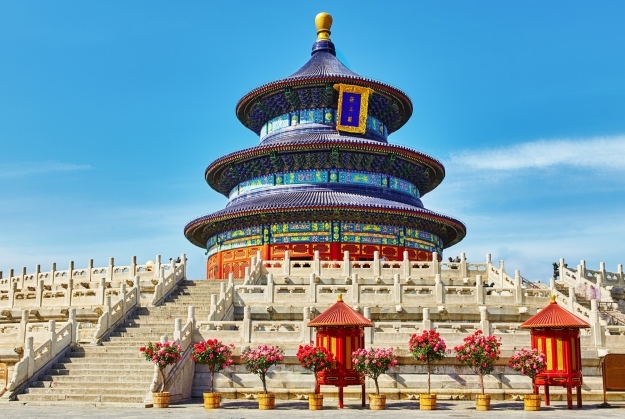 We were curious to find out what Lauren thought of The Temple of Heaven during her holiday to China: “I loved it! I deliberately avoided doing any research before arriving, which is something I often do in order to avoid the crushing sense of disappointment if something doesn’t live up to expectations. “In this case, I needn’t have worried, because The Temple of Heaven complex is seriously impressive. The architecture was stunning, the surrounding park was peaceful, and I felt as though it offered a calm respite from the chaos of Beijing. I’d highly recommend visiting. Now recognised across the globe, the Terracotta Army is an awe-inspiring collection of terracotta sculptures depicting the armies of Qin Shi Huang, the first Emperor of China. The spectacular figures were buried with the emperor in 210 BC to protect him in the afterlife. Incredibly, the warriors were not discovered until 1974, when local farmers in the Lingtong District of Xi’an began digging a well to find a water source on a patch of wasteland. 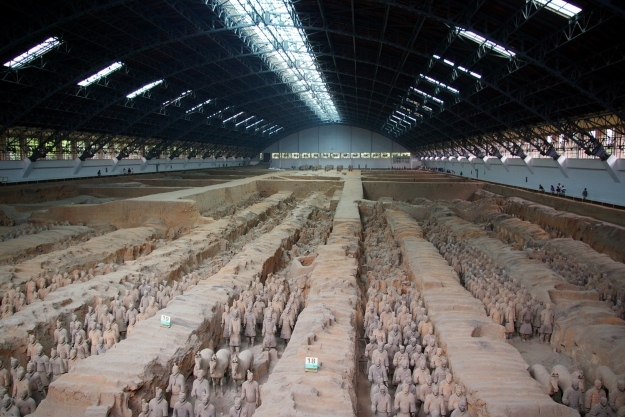 Since the original discovery, archaeologists estimate that the three sections of the emperor’s burial site containing the Terracotta Army feature more than 8,000 soldiers, 130 chariots and 520 horses. Other non-military figures were found nearby including officials, musicians and acrobats. Until you see the Terracotta Army for yourself, it’s very difficult to appreciate its true scale. The project involved more than 700,000 workers, and the attention to detail is remarkable. On your tour of China, seeing the Terracotta Warriors will undoubtedly be one of the highlights. The Forbidden City is considered China’s best-preserved collection of ancient buildings and the largest palace complex in the world. The former Chinese imperial palace from the Ming and Qing dynasties served as the home of emperors, and the political centre of Chinese government for almost 500 years. Today, its pristine citadel walls and perfectly formed rooftops draw visitors from all over the world. The remarkable complex covers roughly 180 acres, and is enclosed by a 10-metre high wall. Each corner of the site features a spectacular watchtower, as the palace was heavily guarded at one time. Its extraordinary symmetry makes the palace a truly mesmerising site to visit. 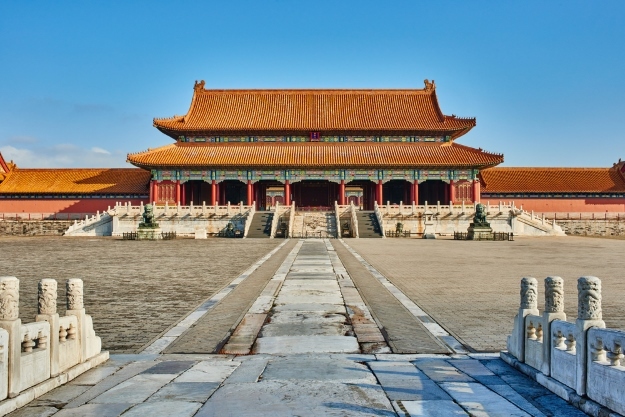 On your China holiday, you’ll get the chance to visit the Forbidden City to discover its rich history, and dynastic artefacts to find out what life was like for emperors in Imperial China. At roughly 3,960 miles long, the Yangtze River is the longest river in Asia and the third largest in the world, after the Nile and the Amazon. Stretching from the Tanggula Range in Qinghai Province in western China through 11 provinces, the river eventually reaches the East China Sea at Shanghai. On your holiday to China, you can experience the impressive Yangtze River for yourself on an intimate cruise. 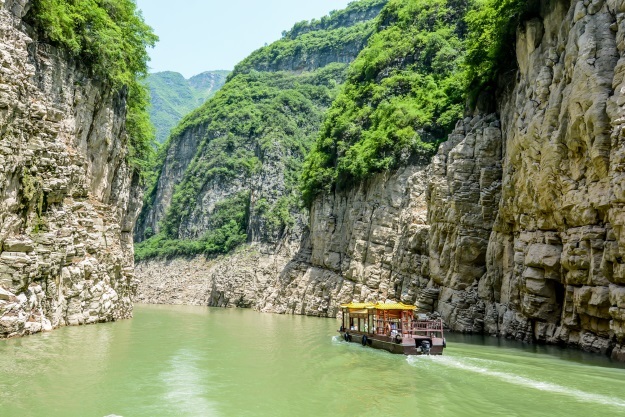 You’ll sail through towering gorges and get a unique view of this spectacular river. The Yangtze River has long played an important role in the history and economy of China. It generates as much as 20% of the People’s Republic of China’s GDP. As well as its economic benefits, the river is also home to many endemic and endangered species, including the Chinese alligator, finless porpoise and Yangtze River dolphin. Somewhat controversially, the river is also home to the largest hydro-electric power station in the world. The Three Gorges Dam was completed in 2012 and has greatly transformed the river, though it considered a great achievement by China. In the heart of Beijing, Tiananmen Square is perhaps most famous for being the site of pro-democracy protests in June 1989. Covering 100 acre, the square is one of the largest public spaces in the world, and it was here in 1949 that Chairman Mao Zedong declared the founding of the People’s Republic of China. However despite its historical significance, it was sadly the site of the Tiananmen Square Massacre, which saw pro-democracy protesters, mostly students, occupy the site for weeks to voice their frustrations about the limits of political freedom in China. The tense occupation of Tiananmen Square resulted in hundreds to thousands of deaths. 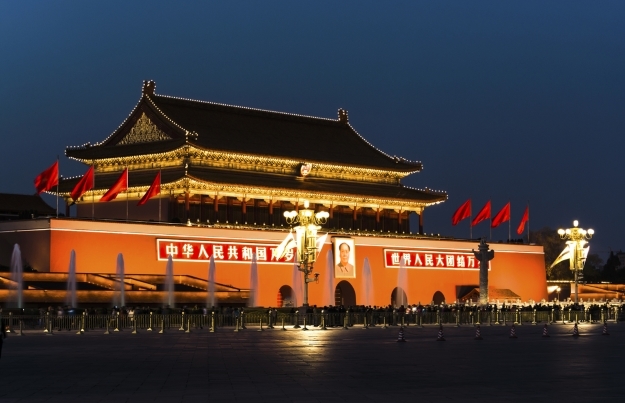 Despite its troubled past, Tiananmen Square remains a popular tourist spot. Its sheer size and ornate architecture, and proximity to other sites in Beijing, make it a fascinating place to visit. To the south of the square is Qianmen Gate, the original gate to the city from the Ming Dynasty. The Great Hall of the People, the meeting place of the National People’s Congress, is also of interest, as is the National Museum of China, where you can see cultural relics from the country’s rich history. Mount Everest, straddling the border between Tibet and Nepal, is the highest mountain in the world above sea level. It can be found in the Mahalangur Himal sub-range of the Himalayas, and at 29,029 feet, is not an easy climb. 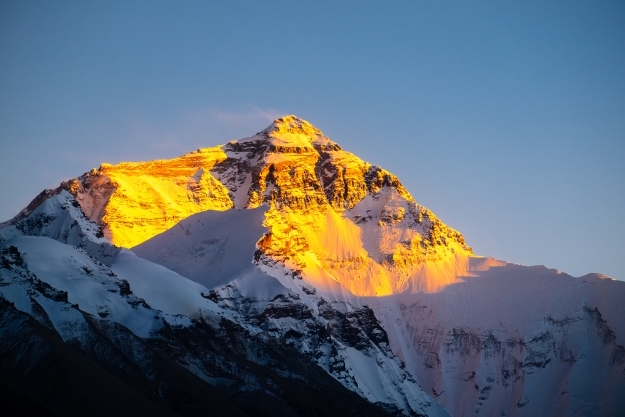 Every year, hundreds of people scale Mount Everest in a daring, gruelling climb. However if you want to experience the imposing majesty of the mountain, without reaching the summit, you can do so on your holiday to China. Our tours give you the chance to head up to Mount Everest base camp and visit the monks at Rongbuk Monastery. The Summer Palace, widely considered to be the best-preserved royal park in China, can be found in the Haidian District northwest of Beijing. Its beautiful surroundings of gardens and lakes makes it undoubtedly one of the country’s prettiest landmarks. Construction of this elaborate palace began in 1750, and was intended as a luxurious garden for royal families to relax and entertain guests. However it later became the main residence of royal members towards the end of the Qing Dynasty. Sadly, the beautiful site was destroyed by fire during the invasions of the Anglo-French Allied Force. 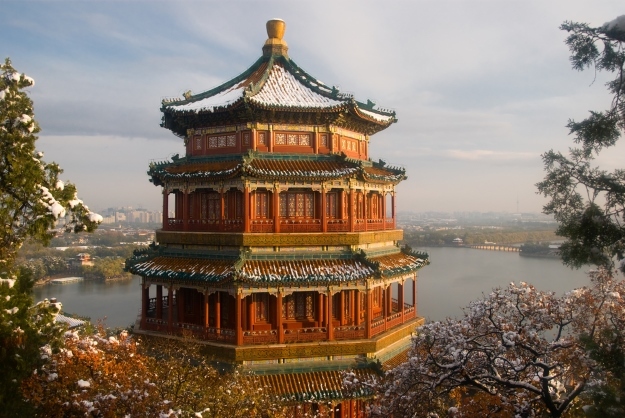 Despite its tumultuous past, the Summer Palace was rebuilt and opened to the public in 1924. The intricate complex has certainly earned its place on UNESCO’s list of World Heritage sites. There are more than 3,000 man-made ancient structures within the grounds including pavilions, bridges and towers. Many holidays to China incorporate a visit to the Summer Palace, so you too can experience what life was like as a royal during the Qing Dynasty. While these are China’s most famous landmarks, the country is full of hidden treasures and lesser-known sites, waiting to be discovered. We hope we’ve inspired you to check out our holidays to China so you can start planning your next adventure in Asia. Book an escorted tour to China with the award-winning tour experts, Wendy Wu Tours. Alternatively, work with our tailormade team to create your dream China itinerary. Whichever you choose, we can guarantee you an unforgettable trip! We also have tours to Southeast Asia, India, Japan and South America. China adventure, culture, top things to see, unesco heritage site. permalink.